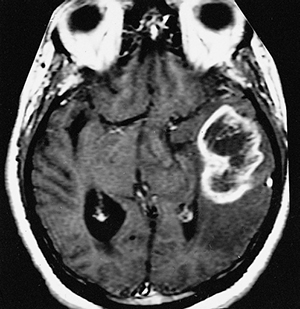 Epigenetic Regulation of ZBTB18 Promotes Glioblastoma Progression. Fedele V, Dai F, Masilamani AP, Heiland DH, Kling E, Gätjens-Sanchez AM, Ferrarese R, Platania L, Soroush D, Kim H, Nelander S, Weyerbrock A, Prinz M, Califano A, Iavarone A, Bredel M, Carro MS.
Glioblastoma (GBM) comprises distinct subtypes characterized by their molecular profile. Mesenchymal identity in GBM has been associated with a comparatively unfavorable prognosis, primarily due to inherent resistance of these tumors to current therapies. The identification of molecular determinants of mesenchymal transformation could potentially allow for the discovery of new therapeutic targets. Zinc Finger and BTB Domain Containing 18 (ZBTB18/ZNF238/RP58) is a zinc finger transcriptional repressor with a crucial role in brain development and neuronal differentiation. Here, ZBTB18 is primarily silenced in the mesenchymal subtype of GBM through aberrant promoter methylation. Loss of ZBTB18 contributes to the aggressive phenotype of glioblastoma through regulation of poor prognosis-associated signatures. Restitution of ZBTB18 expression reverses the phenotype and impairs tumor-forming ability. These results indicate that ZBTB18 functions as a tumor suppressor in GBM through the regulation of genes associated with phenotypically aggressive properties. Implications: This study characterizes the role of the putative tumor suppressor ZBTB18 and its regulation by promoter hypermethylation, which appears to be a common mechanism to silence ZBTB18 in the mesenchymal subtype of GBM and provides a new mechanistic opportunity to specifically target this tumor subclass.